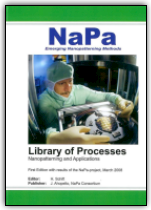 UV-NIL is a nanoimprint method that is based on in-situ material dispense and then using controlled subsequent UV-curing and pressure. 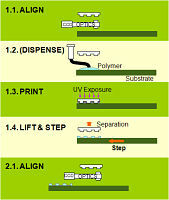 Depending on application requirements, the photoresist can be dispensed after or before the alignment. The stamp, with 3D nanoscale pattern, is aligned to the substrate. The accuracy requirement varies with the application. For some single or first level application, there is no need for alignment: a rough pre-alignment can be sufficient. The stamp is then pressed into the liquid resist to define the desired pattern. Material is cured by ultraviolet light radiation. The stamp is then smoothly separated and - if applicable - moved to next imprint position. Imprinting material is dispensed.The resist is either spun on, in advance, or dispensed onto the substrate according to a specific pattern which guarantees bubble free layer after imprinting. The dispensing pattern impacts the resist flow speed into the stamp cavities.